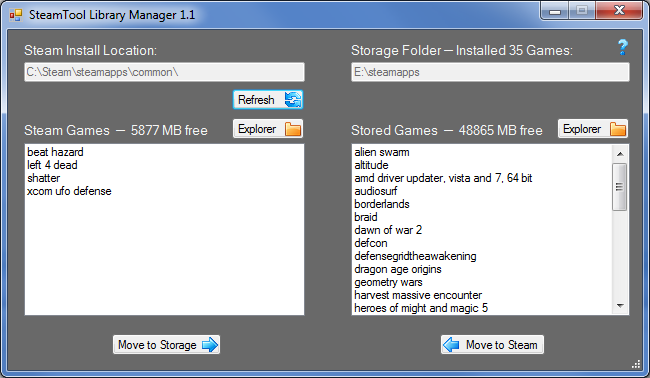 With SteamTool, you can install the games in your Steam Library across more than one hard drive. Games on the second hard drive will continue to play, download and update as normal, since Steam is still able to access them using their original folder names. Create an empty folder on the additional drive that will have games installed on it. 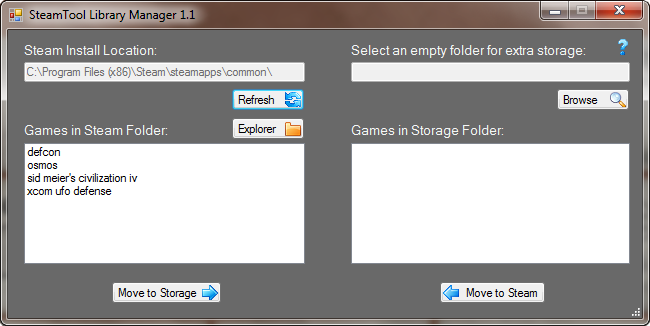 Open SteamTool, and select the folder that you just created. Choose a game from the list and click 'Move to Storage' or 'Move to Steam'. SteamTool makes use of NTFS Junctions. Steam will need to be installed on an NTFS partition for SteamTool to work. You should read this guide explaining how to back up your Steam Library. No warranty is available in case of data loss, etc. Use at your own risk. See the list of known issues for SteamTool at the bottom of this page. Once you create your storage folder and select it in SteamTool, your games will automatically show up, ready to move whenever you open the app. If you find that your games aren't showing, try running SteamTool as an Administrator. 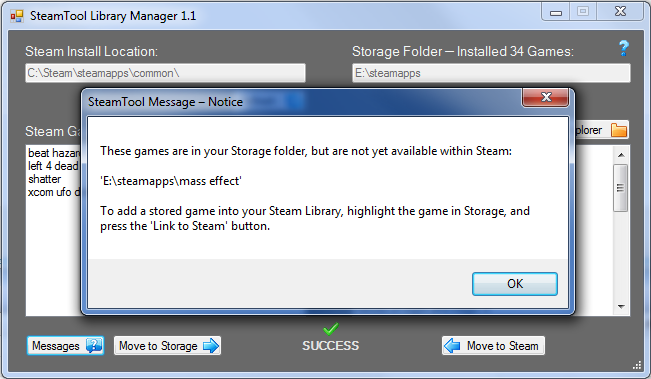 Before any changes are made to the original game, SteamTool confirms that the game in storage is a complete copy of the original. If SteamTool is unable to finish moving your game (i.e. Steam is still using it), you'll still have a copy of your game, and SteamTool will offer suggestions for how to continue. If you want to be sure, just close Steam before moving a game that Steam has recently used. SteamTool automatically detects a variety of issues with your games, and will show a 'Messages' button to warn you of potential problems. After linking a game, you can 'Install' it within Steam, which will download any updates released since you last installed it. If you see a "This game is not available" error, Validating the Game Cache will probably solve it. Valve is repackaging a number of their existing games to use a new content system. You can move games that have been converted to the new content system normally, but there are a few titles that have not been converted yet and won't show up in SteamTool. Windows XP is not supported by SteamTool. Windows XP and earlier versions have incomplete support for junctions in Windows Explorer, making the process somewhat unsafe. For Windows XP users, I would suggest looking at the Link Shell Extension, which works around these problems. User Account Control may require SteamTool to be run with administrative privileges to create links. SteamTool has been tested to work with Windows 8, but may require the installation of an extra Windows component (as detailed in this MSDN article). 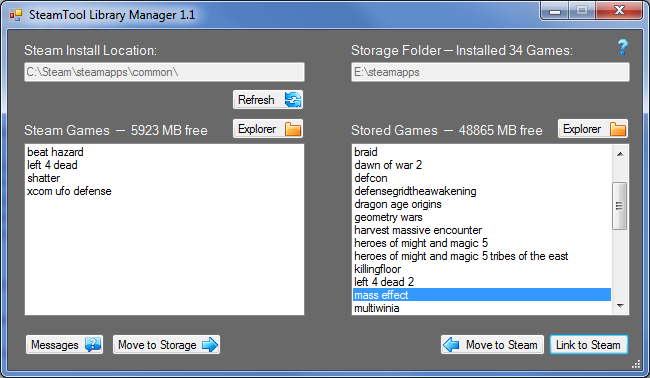 As of November 2012, you can now install certain games to a second hard drive using the main Steam client! SteamTool makes use of Jeff Brown's excellent .NET Junction Library, hosted over at CodeProject. This program was far easier to create thanks to his efforts. Special thanks go out to everyone who provided suggestions for improvements to SteamTool. Program icons are sourced from an free icon set by aha-soft. This is a freely available personal project, and is not affiliated with, sponsored by, approved by, or otherwise related to Valve Software or Steam.